Royal Enfield has unveiled two factory-built custom bikes at the Wheels & Waves custom bike show in Biarritz, France some time ago. 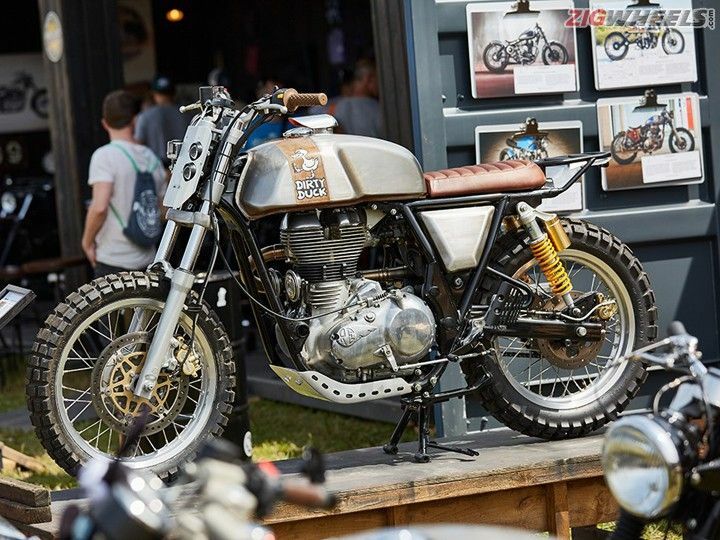 This is the first time Royal Enfield has built custom bikes are based on the Classic 500 and the Continental GT motorcycles, respectively. 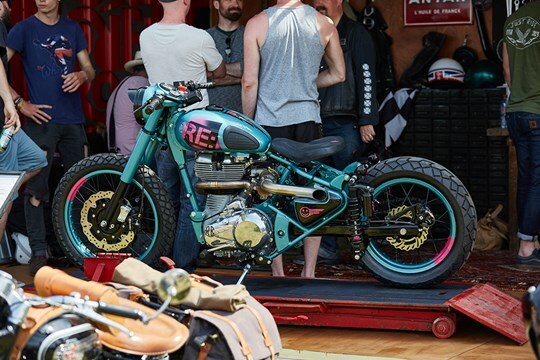 The first custom unveiled is a turbo charged Royal Enfield Classic 500, called Mo' Powa' - Royal Enfield's take on a drag bike. The wheelbase has been expanded and the stance lowered with a Continental GT swingarm and lowered forks with stiffer spring. The handlebar has been flattened keeping in mind the dragster look, and other modifications include K-Tech rear shocks, mounted lower that drop below the swingarm. The most significant change is the turbo charger in the engine, the fuel injection has been replaced with a carburettor, the air box removed and the fuel gauge replaced with a boost gauge. The front wheel has been retained while the rear is a new Excel Rim larger than stock and fitting for the drag strip. Stock tyres have been replaced with Continental TKC70 dual sport tyres. The hand-built exhaust has been fabricated by Harris Performance, and is constructed out of many small sections of tubing, resulting in a look that is only seen on professional MotoGP bikes. The second custom bike called Royal Enfield Dirty Duck is built on a Royal Enfield Continental GT and recreates off-road vehicles which feature deep water wading snorkels. 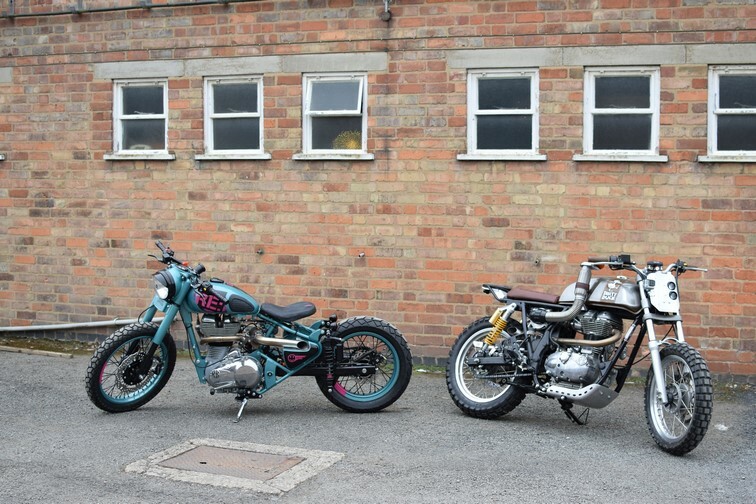 The snorkel has been crafted by Royal Enfield-owned Harris Performance and the air box has been modified to allow the passage of the straight-through, free flow exhaust. The tyres have been replaced with off-road oriented Continental TKC80 rubber, mounted on original rims. An aluminium sump guard protects the motor and frame, which has been shortened at the rear to accommodate a luggage rack. 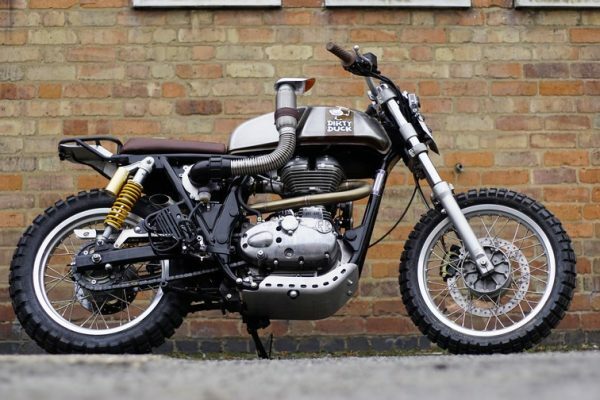 Royal Enfield says the fuel tank has been naturally rusted to "tell a tale of its long life of surviving adventures." At the front, the headlamp and instrument cluster have been redesigned and hand crafted to house two stacked projector headlamps, number plate and a small digital meter replaces the analog stock unit. These two bikes are one-off factory customs, built for the Wheels & Waves custom festival which held in Biarritz, France from 8 to 12 June, 2016. There is no official word on the possibility of production of the Mo' Powa' and the Dirty Duck. 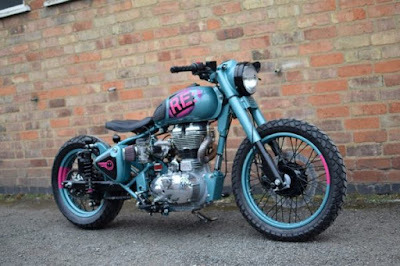 Royal Enfield may offer these add-ons custom kits to personalise bikes to individual tastes.